Schlotzsky’s-Cinnabon-Carvel is coming to Galveston! Get your buns to our new Schlotzsky’s-Cinnabon-Carvel in Galveston at 500 Seawall Blvd! Doors open at 10am on Tuesday, January 29th. First 100 people to buy a Cinnabon 6-Pack will get FREE Schlotzsky’s for a YEAR! We’ll also have a day full of fun, games, prizes and more. Don’t miss out on the food & fun! *One small The Original sandwich per week at this location for 52 consecutive weeks commencing on January 29, 2013 and expiring on January 29, 2014. Only valid for persons 18 years or older. Offer valid only at the Galveston Schlotzsky’s. MIDWEST CITY – When customers step into Midwest City’s new Schlotzsky’s at 2400 S. Air Depot in Midwest City, they will experience a design and plan unlike any of the chain’s other restaurants in the U.S. Restaurant owner and Midwest City native David Jones also owns DLJ Holdings. DLJ Holdings owns the land and building that Schlotzsky’s inhabits. However, his design is unique. The restaurant is part of a revitalization plan introduced by Midwest City to bring new life into an old neighborhood. The chain restaurant façade fits with Midwest City’s Original Mile plan, occupying the bottom of the two-story building. Four 800-square-foot, one-bedroom apartments are on the second floor. The two-story concept is unusual for a modern chain sandwich shop. Jones said by participating in the Original Mile plan, he not only has the most beautiful Schlotzsky’s in America, but also is contributing to an area he feels will be the next big thing in central Oklahoma. The vision of the Original Mile plan is to revive the area by building on the original concepts that earned Midwest City recognition as “America’s Model City” by the National Association of Home Builders in 1951 while creating a distinctive, desirable and quality neighborhood of the future, said Billy Harless, the city’s community development director for Midwest City. “New and improved commercial and retail areas will complement the existing town center and provide for innovative mixed-use development,” Harless said. To put the plan into place, the Midwest City officials conducted site visits, interviews and meetings with city staff members, community members and residents of the Original Mile. Established in 1942, Midwest City was a one-square-mile area that consisted of homes, a school, a park and a retail district. The Original Mile is between Air Depot and Midwest Boulevard and SE 15th and SE 29th streets. The neighborhood was developed as housing for the Midwest Air Depot, later renamed Tinker Air Force Base. Both the city and Tinker have grown substantially and the old neighborhood needs a redo, officials said. City planners have developed a long-range plan for the blighted neighborhood. Besides new mixed-use developments that include urban apartments, the plan also includes new streets, new façade and even a neighborhood amphitheater and plaza gathering area. Additional commercial development is already under way at Air Depot Boulevard within the Town Centre Plaza complex. The mixed-use concept is new to Midwest City and includes upscale first-floor commercial space for office or retail and upscale apartments on the second floor. Jones said the new Schlotzsky’s, which opened on Dec. 30 at 2400 S. Air Depot, fits the concept and is unlike any other in the nation. The building also has a grand balcony, a cobblestone drive and a drive-thru with private screening elements. Landscaping and finishing touches are under way. The apartments, which are currently unnamed, are expected to open for residency at the end of February. The design of the entire structure includes 33-foot walls on one side of the development, vibrant colors and up-and-down lighting to enhance the design. Harless said many of the concepts are to make the area as a whole more appealing. Midwest City has an advantage in that it has a general lack of dilapidated structures, but still has good neighborhood design. The city currently plans to remove the water tower at the site of the former City Hall and install a new cell tower that will be built decoratively to make more aesthetically pleasing. Though the neighborhood currently has three public parks, the addition of small pocket parks is also a part of the plan. • Introducing a new streetscape throughout the Original Mile with new curbs, gutters, sidewalks, traffic-calming methods and trees. • A Capital Improvement Plan to provide a guide to systematically improving infrastructure in the Original Mile. • Promotion of home revitalization design options for façades, remodels and infill for existing homes in the area. • A community civic space for a major public outdoor venue that links Town Center Plaza to the neighborhood and draws city and regional audiences, using the new camouflaged cell tower as a focal point. • Keeping single-family homes and duplexes as the predominant housing choice, add innovative housing through mixed-use developments and consider row homes around the community civic space. • A phased funding and priority plan. Get your buns to the Schlotzsky’s-Cinnabon-Carvel grand opening at 20821 US Highway 281 N in San Antonio on Tuesday, January 22. Doors open at 10am and the first 100 guests to purchase a Cinnabon 6-Pack will get free Schlotzsky’s for a year! 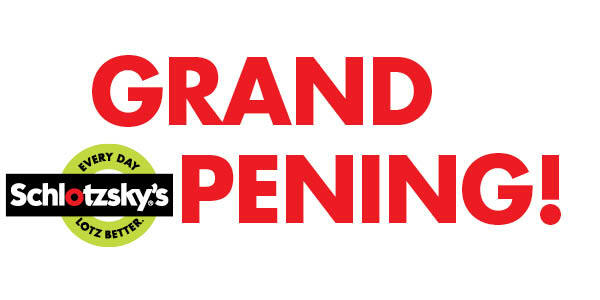 Grand opening events will also include fun-filled events, games and prizes, giveaways, and more. *One small sandwich per week at this location for 52 consecutive weeks commencing on January 22, 2013 and expiring on January 22, 2014. Only valid for persons 18 years or older. Offer valid only at this San Antonio Schlotzsky’s. FOCUS Brands Inc., the fast-growing company responsible for overseas expansion of Cinnabon, Auntie Anne’s Pretzels, Carvel Ice Cream, Moe’s Southwest Grill, Schlotzsky’s, and Seattle’s Best Coffee, has opened its 1,000th international location—a milestone capitalizing on the vast global opportunities for U.S. food brands. The 1,000th location is a cobranded Cinnabon and Auntie Anne’s store, which debuted November 29 in Port of Spain, Trinidad, at The Fall of Westmall. It is operated by Cinnaworld Ltd., a franchise group consisting of a husband-and-wife team from Trinidad. Naveed Mohammed and Renee Peterson are entrepreneurs by trade and have opened a total of five Auntie Anne’s and Cinnabon stores in the Trinidad and Tobago area. The duo recently expanded their territory rights to include Jamaica, Guyana, Barbados, Antigua, Barbuda, St. Lucia, and Grenada and have committed to opening an additional 15 locations over the next seven years. The group, Cinnaworld Ltd., also received the award for “International New Franchise Partner of the Year” for 2011 at the FOCUS Brands Worldwide Convention in January 2012. In 2012, FOCUS Brands opened 205 locations in international markets, and a projected 260 will open this year. This growth comes while FOCUS Brands continues to increase its domestic footprint in the U.S. through franchise expansion of all brands. Earlier this year, Cinnabon and Carvel became the first American brands to open in Libya, with nine additional Cinnabon bakeries and new Carvel and Moe’s Southwest Grill locations on the way. Moe’s Southwest Grill and Schlotzsky’s recently expanded to Russia. More than 80 new Auntie Anne’s bakeries have opened in 2012 internationally and plans call for more than 118 to open overseas in 2013 in countries such as Vietnam, Bahamas, India, and Aruba, as well as Ukraine, Kazakhstan, Estonia, Latvia, Lithuania, Georgia, Moldova, Uzbekistan, Kyrgyzstan, and Tajikistan. Cinnabon bakeries operate in more than 51 countries and will launch in Iraq, Mongolia, and Ukraine in the coming year.